Cooking without a Net: What Could Be Better Than Cacao Nibs? The holidays are over and I'm already settling back into the daily routine, which means I'm trying to wean myself back off of sugar. 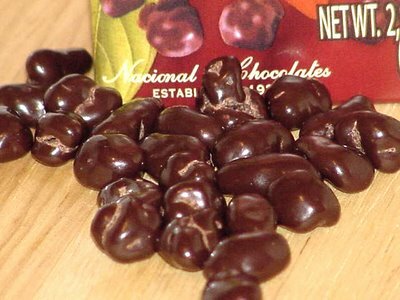 Which is really hard because I have these beautiful little chocolate covered cacao nibs that I found at the World Market in Austin when I went shopping with my sister. Chocolate Santander is a Columbian company. 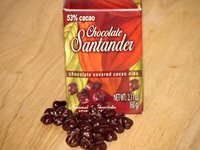 If my Spanish were better I could probably tell you more about it, but it looks like they have chocolate covered coffee beans and chocolate covered cacao nibs Their products are organic, GMO free, and are "fairly traded with with small farmeres from our country." Oh, and did I mention that they're also kosher, and ISO certified? They actually taste a lot like chocolate covered coffee beans, but they're smaller. They would be good on ice cream and would make a lovely garnish for any cake or cookie. I can think of all kinds of fun things to do with these babies. We had all kinds of treats over the holidays. My sister brought over some wonderful cinnamon bread she picked up at a local kolachy shop and some awesome Chocolate Almond Laceys made by Desserts on Us (the picture does not do them justice). I found an assortment of chocolate-covered marzipan that disappeared pretty much within a few hours of being opened. And my nephew brought a box of crack almond toffee home from Christmas in Galveston with him. I can't remember the name of that stuff, but it warrants a post all its own when I find out what it was. It's one of those things that doesn't look all that impressive, and you can't believe anything could really be as good as everyone says it is. Then you put some in your mouth and it just melts into the most amazing buttery sugary almondy with just a hint of chocolate puddle in your mouth. You don't really swallow; it just kind of flows down your throat. Ok I have to stop now. The stores are still open and I must not have any more sugar!